West Nile Virus belongs to a family of viruses called Flaviviridae. Other viruses that are members of that family cause Dengue and Yellow Fever (these viruses do not cause disease in Canada). Most people infected with the virus have either no symptoms or have flu-like symptoms. The infection generally lasts for one week, but feelings of lethargy and general malaise can persist for a few weeks. 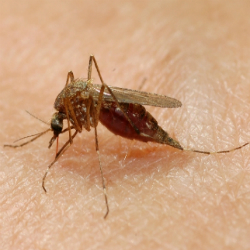 What can you do to prevent West Nile Virus from affecting your family?